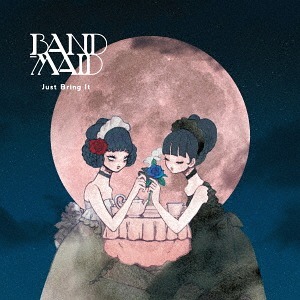 After the mini-album « Brand New Maid » released on may 2016 through JPU Records, this is the second CD of BAND-MAID to go out here. After blasting in to the international rock scene last year, BAND-MAID return with their hotly anticipated first major album. Entitled Just Bring It, the 13-track album Ce premier full album arrive après une première tournée mondiale réussi pour le groupe. Intitulé « Just Bring It », it includes 13 tracks including the previous single of the group, « YOLO », released last November only in Japan. Two editions will be available : a regular edition and a CD and T-shirt bundle. Both editions contain exclusive translations of the lyrics within the booklet. 2016 saw the band embark on their first headline world tour, including a sold-out show at The Underworld in London, over a thousand fans descend on Mexico's Sala as well as packed out club-events across France, Germany and Poland, along with comic con appearances in London, Spain and Italy. The same year also saw the international release of the band’s HMV recommended mini-album Brand New MAID which led to the Huffington Post Blog dubbing BAND-MAID « one to watch ». "I flew over to Japan to check out BAND-MAID two years ago, and they haven't stopped knocking my socks off since. Just Bring It is probably their most powerful record yet. I can't wait to get them back overseas to hear it live" – Tom Smith, JPU Records' founder and CEO. Japan's marketing campaign for Just Bring It has seen vocalist and guitarist MIKU KOBATO transformed into a 2D video game character for popular Japanese mobile game Valiant Knights, as well as feature on a giant poster that's currently towering over Tokyo's famous Shibuya Crossing, several storeys high. You can pre-order this album directly from JPU Records : Edition CD+T-shirt, Edition CD. Take me higher ! !